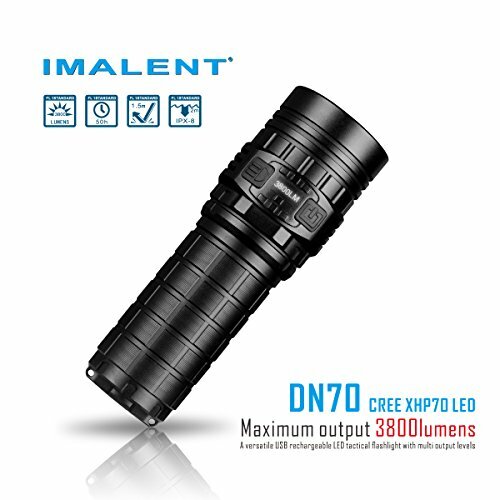 The IMALENT DN70 is a versatile USB rechargeable LED tactical flashlight with multi-level outputs and an OLED display. The OLED display shows the battery voltage, output, charging status, and has a flashing overheat warning, which makes it easier to know the status of the flashlight. Utilizing the latest CREE XHP70 LED technology, its aluminum OP reflector helps distribute the beam more evenly. There are four output levels, which you can easily select with the tactical-switch button. With a maximum output of up to 3800 lumens, the IMALENT DN70 is perfect for any situation. Pocket size portability, single cell 4500mAh 26650 Li-ion rechargeable battery, advanced temperature control module, low voltage warning, and low power protection make the DN70 the perfect flashlight for working, exploring, searching and rescue, or any other occasion. 3800 lumens max output using one cool white 'flat 'CREE XHP 70 LED with a total of 4 light-emitting cores. Minimum output of 20 lumens, which is suitable for long periods that can last for 50 hours. Powered by one 26650 rechargeable li-ion batteries of high discharging rate , providing up to 2500 lumens of output with two and half hours of run-time. Desigh of portable lanyard;Palm-sized body; Active Thermal Management: MCU detects the flashlight temperature through the internal thermal sensor in real time, and prevents overheating by reducing the output. This bundle includes original Imalent 26650 rechargeable battery and USB charging cable. If you have any questions about this product by IMALENT, contact us by completing and submitting the form below. If you are looking for a specif part number, please include it with your message.